Golden rides the foothills right up to the thrust of the Rockies, in the shelter of North and South Table Mountains and next to icy Clear Creek. Although the city has maintained its small-town character and look, it is on several must-see lists. Colorado School of Mines is an internationally known center of study about geology and engineering. Coors Brewing Co. has put “Rocky Mountain spring water” to good use since 1873. Federal labs draw attention to renewable energy and earthquake science. Golden was founded abruptly in 1859 to accommodate the rush of miners heading for the Pikes Peak Gold Rush. Golden City, the original name for the new town, actually had nothing to do with the miners’ hopes, but was intended to honor Thomas Golden, one of the early placer miners working the streams of the area. 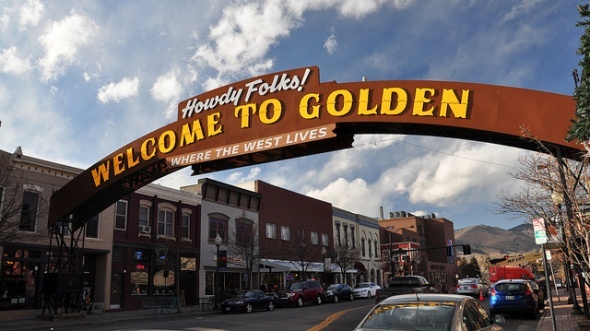 As the arch over its main street still proclaims, Golden stood as a gateway, providing the first train into the Colorado mountains. The town boasted several flour mills, a brickworks, the only paper mill west of the Missouri, an opera house and five smelters where lucky miners brought their raw ore. In 1860, Golden became the county seat for Jefferson County and the capital of the provisional Jefferson Territory. The diverse population included German, Swedish, Italian and Chinese immigrants. In the post-World War II boom, Golden almost tripled in area, with massive annexations to the south. New subdivisions have filled in on the south and north. Fossil Trace Golf Club, completed in 2003, hugs contours created 64 million years ago, complete with dinosaur footprints and fossils still on site. Just past the golf course on Highway 93 rises the Jefferson County Courthouse, nicknamed the Taj Mahal for its domed roof. Land area: 9 square miles. County: Jefferson County (Golden is county seat). Altitude: 5,675 feet above sea level.